April 22, 2012 - US Airways Management announced they have signed agreements with three unions at American Airlines, the Allied Pilots Association (APA), the Association of Professional Flight Attendants (APFA), and the Transport Workers Union (TWU). 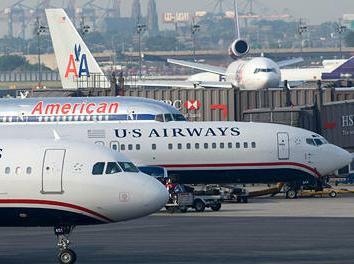 The three unions issued a joint statement of support for a merger with US Airways. ?We look forward to working with our contemporaries at American Airlines; however, if a deal is made, it must include a solid and mutually beneficial commitment by our Management that recognizes the sacrifices the pilots have made to keep these two airlines flying.? USAPA's Officers have been in conversation with their counterparts at the Allied Pilots Association the past few days, and have scheduled their first face-to-face meeting next week to discuss the details of a potential merger. ?The pilots from American Airlines and US Airways have a lot in common," USAPA President Captain Gary Hummel stated. "After the 9/11 attacks, American pilots took billions in contract concessions that remain in effect. Likewise, the US Airways pilots lost their pensions and gave up more than $7 billion in wage and benefit concessions in order to keep their airline solvent. There have been very few tangible benefits for US Airways pilots as a result of the 2005 Merger with America West, which still has not been fully completed.? Captain Hummel went on to say, "We look forward to working with our contemporaries at American Airlines; however, if a deal is made, it must include a solid and mutually beneficial commitment by our Management that recognizes the sacrifices the pilots have made to keep these two airlines flying." The International Association of Machinists and Aerospace Workers (IAM) reassured its members at US Airways that it will aggressively represent their interests in any potential takeover of bankrupt American Airlines. ?The IAM?s first responsibility is to protect the seniority, job-security, wages, benefits and pensions of our members at US Airways,? said IAM Transportation General Vice President Sito Pantoja. ?We have a long history at US Airways, with substantial experience defending members during mergers and uncertain economic times. We are fully prepared to protect our members as this process unfolds.? While US Airways made its intention to acquire American Airlines public, the move is certain to encounter many obstacles, including bankruptcy court, shareholder approval and regulatory scrutiny. ?Too often we have seen airline consolidation advance at the expense of airline workers, except for the corporate executives who cut jobs, raise fares, reduce service, and shower themselves with cash and bonuses,? said Pantoja. ?The IAM will oppose any merger that would take place at the expense of workers, the flying public, and the communities served by these two airlines.? ?Employees at both carriers can be assured that the IAM will utilize every available resource to ensure they are protected during this process,? said Pantoja. ?The IAM will fight for the fair treatment of all employees at US Airways and American Airlines. ?